I am still recovering from watching the disingenuous series called The World Wars. (Hint: the Jews did nothing to cause Germany to lose World War I.) I might write a review of the series later, and point out all the omissions and mistakes, but for now, I am going to write about the first Thirty Years War, which determined Germany’s history for many years. 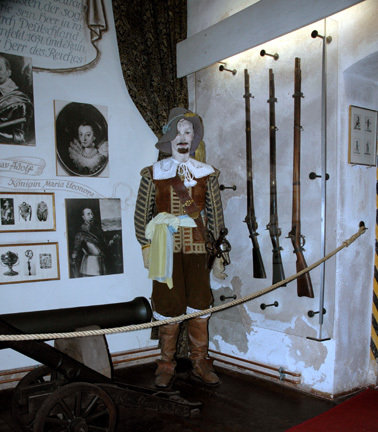 I learned about the first Thirty Years War when I visited a Museum in Rothenburg op der Tauber several years ago. The photos shown above were taken in the Museum. 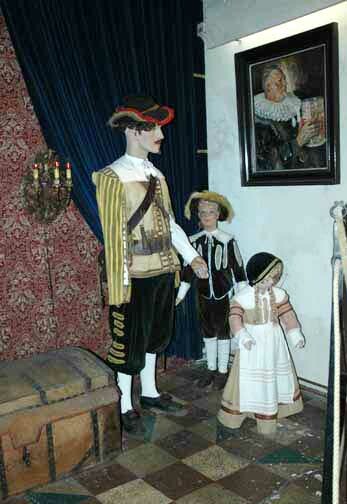 In the second photo above, note the painting, in the upper right hand corner, which shows the former mayor of Rothenburg, Georg Nusch, holding the 3 and 1/4 liter tankard of wine which he drained in one gulp to save Rothenburg from destruction in 1631 when the Catholic forces of General Tilly conquered the town. The story is that General Tilly was greeted by Rothenburg citizens who offered him some wine in the ceremonial tankard. Legend has it that he was proposing to destroy Rothenburg, but promised to save the town if anyone could down a tankard of wine without stopping. Georg Nusch met the challenge and the town was saved. 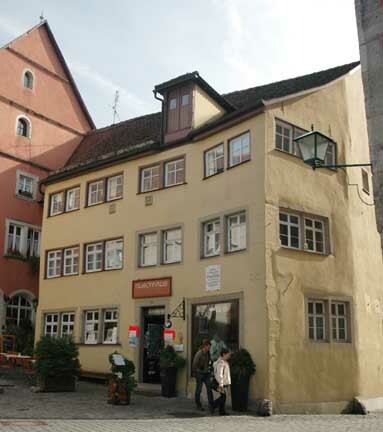 The house where Georg Nusch lived is shown in the photo below. The events that led to the Thirty Years War started in 1526 when Archduke Ferdinand of the Hapsburg family in Austria became the King of Bohemia, a province that is now in the Czech Republic. This started a long period of hostility between the Catholic Hapsburg rulers and their Protestant Czech subjects. In 1617, Ferdinand of Styria, another member of the Hapsburg family, became the King of Bohemia, and two years later, he was elected as the Emperor of the Holy Roman Empire of the German nation. This upset the Bohemian Calvinists who were worried about losing their religious rights. In 1618, an incident in Prague, the capital of Bohemia, brought about the Thirty Years War. This incident is jokingly referred to as the “defenestration” from the German word Fenster which means window. What happened was that some Bohemian Calvinists threw two of the Catholic councilmen out of a window that was over 50 feet above ground. The men survived only because they landed in a pile of manure. This violent act symbolized the Czech national dissatisfaction with the rule of the Catholic Austrians in Protestant Bohemia. The Hapsburgs won the initial phase of the war in 1626, crushing Bohemia, and as a result, the Czechs did not regain independence until 1918 when the new country of Czechoslovakia was formed, following Germany’s loss of Bohemia in World War I. After the victory by the Catholic Hapsburgs in Bohemia in 1626, there followed a war between the German states and Denmark, which ended with a Catholic victory and the Peace of Lübeck in 1639. During this conflict, the German forces were led by General Albrecht von Wallenstein, who became the tragic hero of Friedrich Schiller’s greatest play a century later. In 1630, a powerful Swedish army, led by King Gustavus Adolphus invaded the German states in support of the Protestant forces. The Swedish King was killed in battle in 1632. It was during this phase of the war that Rothenburg ob der Tauber was attacked by the Catholic forces of General Tilly. This phase of the war ended in 1635 with victory for the Catholics and the Treaty of Prague. The worst was yet to come: Cardinal Richelieu, the Chief Minister of the French King, ignored the Treaty of Prague and put together an alliance between Catholic France and Protestant Sweden for the purpose of defeating the powerful Hapsburg Empire of Austria and their Spanish ally, the Hapsburg King of Spain, Philip IV. The fighting took place mostly in the German states; the Peace of Westphalia, that ended the Thirty Years War in 1648, determined to a great extent the outline of modern Germany. The Thirty Years War caused so much death and destruction that it took 100 years for the German states to recover. There were so many German men killed that the remaining men had to take more than one wife. France emerged as the undisputed super power on the European continent, annexing the German states of Alsace and Lorraine after their victory. The French dominated the German states to such an extent that German royalty spoke French and adopted French customs. There was virtually no German literature for years afterwards because the educated people preferred Latin. The first German state to recover from the effects of the Thirty Years war was Prussia under the leadership of Frederick the Great, a German King who was still speaking French in the 18th century. Prussia became a great power when it acquired Silesia (where the town of Auschwitz was located) after the Seven Years War which ended in 1763. Then the Prussians defeated the French in the Franco-Prussian war in 1870. This led to the unification of the German states in 1871 under the King of Prussia who became the first Kaiser (Emperor) of the German Reich. The victory of the Germans in 1870 was the last war that the Germans ever won. From there, the history of Germany has been all downhill, but the German people have finally learned their lesson, after losing two world wars, and they now bow down to the Jews. The present country of Germany is only a fraction of the size of the former Holy Roman Empire of the German Nation. The division of the German states was their downfall as Hitler rightly said many times. Imagine a strong German state united in the early 18th century.it would have been the dominant world power for centuries.